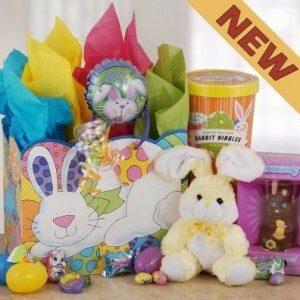 The Hoppin Fun Easter Gift Basket ($57.99) has all of the best Easter goodies in a colorful basket. It has filled Easter eggs, candy, cookies, and a soft plush bunny. Send a colorful bunny and a couple yummy Easter treats with the Easter Nibbles ($24.99) basket. It also has a fun reusable container too! Want to give a basket that will spread the most Easter cheer? The Peter Cottontail Easter Basket ($58.99) has cookies, candies, a balloon, a soft plush bunny, and a chocolate Easter bunny all packed into a spring basket. 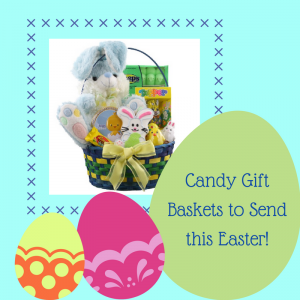 Be sure you order your candy gift baskets soon so they arrive in time for Easter! Shop more Easter options at BisketBaskets.com, where you’ll find gourmet cookies, baskets, and more. Chocolate – it’s one of nature’s greatest creations, and now you can enjoy its heavenly flavor when you receive one of our chocolate gift baskets. Whether you’d like to surprise that special someone with the perfect gift or deliver a delicious care package to a friend, you simply cannot go wrong with one of our chocolate gift baskets! We have the best chocolate gift baskets around with arrangements for any occasion. Here are three that we particularly love! 1. Ghirardelli Chocolate Candy Bouquet – If the stunning arrangement of this basket doesn’t captivate you, its glorious palette certainly will! This chocolate gift basket is every chocolate lover’s fondest dream with its signature creamy texture and melt-in-your mouth goodness. 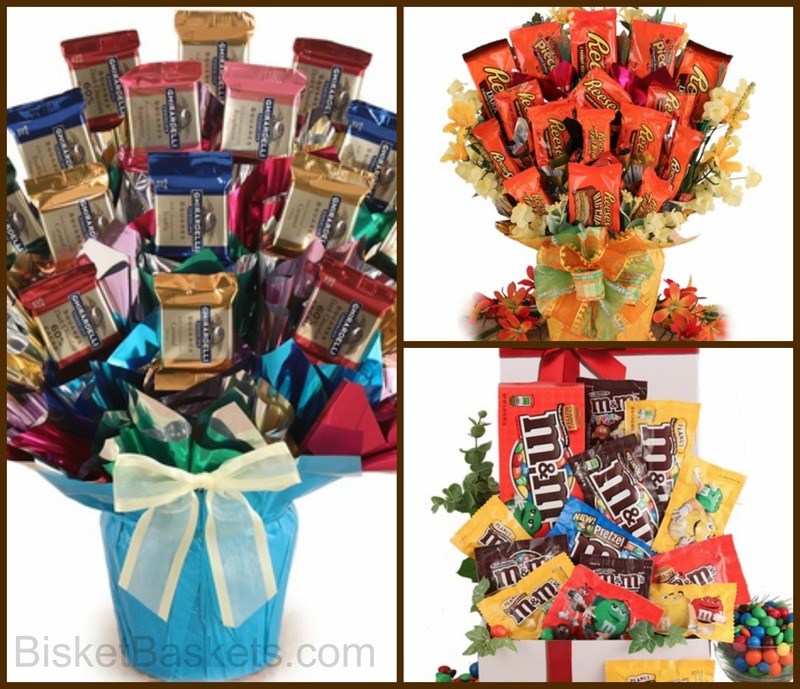 This arrangement is loaded with Ghirardelli chocolates to satisfy any sweet tooth. 2. Radical Reese’s Candy Bouquet – We all have that friend who goes gaga over Reese’s peanut butter every time. Maybe that certain somebody is you! In either case, it should come as no surprise to you that this is one of our most popular chocolate gift baskets. Chocolate and peanut butter have never tasted better! Enjoy this Radical Reese’s Candy Bouquet on any occasion. 3. M&M’s Care Package – Now this makes for one sweet gift idea! What better way to show that special friend or colleague in your life that you care than by sending them our M&M’s Care Package? Easter Gift Basket Bouquets: Chocolate Gets Us All Hippity Hoppity Happy! Have we told you lately how much we love chocolate? We try not to say it too often, as it’s pretty much a universal love. Apart from eating chocolate alone, people find all manner of ways to incorporate it into their everyday lives. There’s chocolate flavored ice cream, chocolate milk, hot chocolate, chocolate cakes and pies, chocolate syrup, and chocolate dipped fruits. There are of course millions of other chocolate creations, but you get the drift! 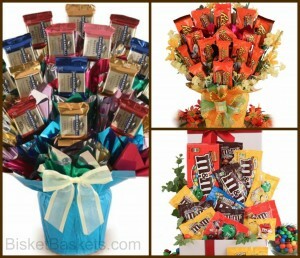 Reese’s Easter Candy Bouquet – Roses are Red, Violets are Blue, Candy is Better, Don’t You Think So, Too? Because we do! And to say this Reese’s gift brings on the peanut butter and chocolate in spades is an understatement. Artfully arranged to replicate a flower bouquet, this candy bouquet is made up of sweet stems of treats. Available in 3 sizes, it’s easy to find the one that best fits your budget or the recipient’s appetite. Easter Candy Bouquet Assortment – Does your favorite chocolate lover also count non-chocolate candies as a must-have? This charming and colorful variety bouquet certainly serves up some chocolate, but also works other Fun Size treats into the mix. Candies might include Butterfinger Eggs, Starburst, Skittles, M&M’s Minis, and more. Extreme Reese’s and M&M’s Easter Basket – Can’t decide if you want to send M&M’s or Reese’s? With this basket, there’s no wrong answer! Bursting with plenty of both, to include both full size and fun size packs, this Easter basket is perfect for the chocolate lover who likes to mix things up. Like all our basket bouquets, this style is designed to look great from the front and the back. It also tastes great from every angle! Easter Gift Baskets and Treats – We Just ‘Hoppen’ to Have the Best! In our last blog post – Building Beautiful Gift Baskets: More Than Meets The Eye! – we gave a tidy breakdown of everything that goes into creating an attractive, memorable gift basket. This includes not only time, skill, patience and passion, but the cost of all the necessary supplies as well. Gourmet Caramel Apples – $12.99 – These are almost too pretty to eat, but also too delicious not to! Bisket Baskets is proud to offer Amy’s Gourmet Apples, tempting treats from a company that has been serving up the sweetness for over 15 years. An affordable indulgence accented with a shiny, seasonal bow, this jumbo Granny Smith apple is smothered in buttery caramel and rolled in a heavenly sprinkle and peanut mix. Sweet and nutty, the texture and flavor are decadently delightful. Easter Cookie Care Package – $36.99 – Is the sweet-lover on your list more of a ‘cookie person’ than a ‘candy person’? Make their day even more special with this adorable box of beauties! Each of the truly scrumptious cookies is artfully hand-decorated, making them as tasty as they are attractive. Also included is a snuggly soft plush Easter Bunny that will surely last longer than the cookies do! They can bring him out every year and remember your thoughtful gift. 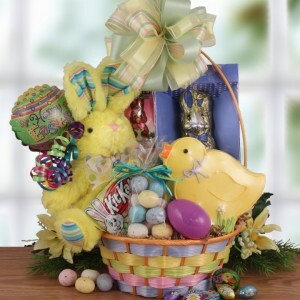 Happy Easter Gift Basket – $62.99 – This eye-catching Easter gift basket offers up oodles of flavorful fun! Inside the gorgeous woven basket your lucky giftee will find a Bissinger’s Milk Chocolate Bunny, Gourmet Jelly Beans, Hand-decorated Easter cookies, Ghirardelli Squares and more! This Easter gift is also a great choice if you want to send something a whole family can enjoy. They’ll just have to fight over the bunny ears! It’s hard to believe Easter is just a bunny hop away, but we’ve already been hard at work creating Easter Gift Baskets for our loyal customers. We’ve noticed that our Ghirardelli Easter Basket has been one of most popular Easter gift baskets for the last few Easter seasons, and we thought we’d take some time to shed the spotlight on the company that is Ghirardelli – the makers of absolutely fine chocolates. Ghirardelli was incorporated in 1852 and is still in business today – that’s a whole lot longer than most businesses these days! They’re proud to be able to say that they control the entire chocolate manufacturing process for their chocolates, meaning that they are able to ensure their chocolate is as exquisite as Ghirardelli requires it to be. Ghirardelli is a company with high standards, and they make sure their chocolate reflects this. Variety Is The Spice Of…Chocolate? We love to hear from our customers, and one of the common feedback themes from our Ghirardelli Easter Basket customers is how they love the different Ghirardelli chocolate varieties in it. We include different varieties in each Ghirardelli Easter Basket, but you can rest assured knowing that each will include four 3.5 oz Ghirardelli chocolate bars, two .53 oz Ghirardelli assorted chocolates, and 2 oz. Ghirardelli double chocolate caffe. Ghirardelli has found a niche for itself in developing different varieties of chocolate, such as their LUXE MILK™ Hazelnut, LUXE MILK™ Toffee, Dark Chocolate with Raspberry Filling, Dark Chocolate with Sea Salt Caramel Filling, Dark Chocolate with Orange, and so much more. We take pride in each and every Easter gift basket that we create, and we always want to make sure the goodies inside them reflect this commitment to quality. 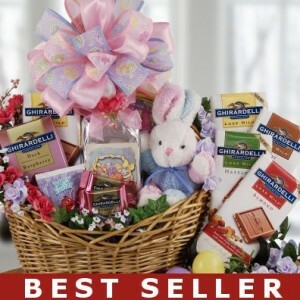 Ghirardelli has the same high standards we do, and together we’re proud to offer our Ghirardelli Easter Basket! Easter egg hunts are an Easter tradition, and except for some of the prizes, they really haven’t changed much over the years. I remember waking my parents up at the crack of dawn on Easter morning (I’m sure they loved that! ), and excitedly announcing that the Easter bunny was here, and could they please oh please wake up so I could find my Easter basket?! Some of my friend’s parents would simply hand them their Easter baskets, but not mine. My Mom – I mean, the Easter bunny – would take the time to fill small plastic colored eggs with some of that green Easter “grass”, and add little slips of paper with clues to where the next egg was creatively hidden. It was all kinds of clues – from “Mom heats leftovers in here” (microwave) to “I get squeaky and clean here” (shower), and “The Tooth Fairy leaves a treat under here” (pillow). She usually hid about ten eggs around the house, and the last clue was always the hardest, as it would lead me to my Easter gift basket, filled with wondrous chocolate delights, Marshmallow Peeps, and all kinds of deliciousness. Sure, there wasn’t anything ostentatious about it, and it was pretty much the same routine year after year, but I will never forget those Easter mornings, and my excitement was palpable each year. I still continue the Easter egg hunt tradition for my own nieces and nephews, with chocolate filled Easter gift baskets at the end of the hunt. My now-adult siblings and cousins remember how much fun Easter egg hunts were as youth, so I even put together a small egg hunt for them too – the only differences are that the clues have to be harder, and the Easter Gift Baskets a little more gourmet! I encourage you to do the same on this year’s Easter morning – start a tradition by having a fun Easter egg hunt for your little ones, and even the adults in your family. After all, who doesn’t love some chocolate Easter candy, even if they have to hunt for it? Easter is just a few weeks away and if you want to be sure that you’re prepared to delight your family and friends on Easter morning, then you’ve got to start shopping for the supplies to make your Easter baskets now. But chances are, if you’re like most people, you probably don’t have time right now with all of the hustle and bustle of spring. You need an easier way to get things ready for the holiday while at the same time, ensuring that you can give something sweet and thoughtful to those you love on Easter. Not to worry, BisketBaskets.com has you covered. BisketBaskets.com is the perfect way to save time and money when it comes to Easter shopping. With us, there’s no stressing over finding the perfect gift or having to search through a big box store to find everything you need. You don’t have to fight for a parking space to shop with us either. Just take some time and with the click of a computer mouse, you’ll be ready for Easter morning with beautiful gourmet Easter baskets filled up with tons of delicious goodies. You won’t have to put them together the night before this year, thank goodness! Our Gourmet Easter Baskets come fully assembled and ready to be gifted from the moment they arrive at your door. Did we mention our Easter baskets are also really affordable? Instead of having to pick up tons of individual items, a basket, and trimmings (all of which can be expensive), a Gourmet Easter Basket from BisketBaskets.com solves all of your stress and hassle, without putting too much of a dent in your wallet. Easy ordering, affordable prices, and a wide gourmet Easter basket selection that’s always beautiful – what’s not to love? 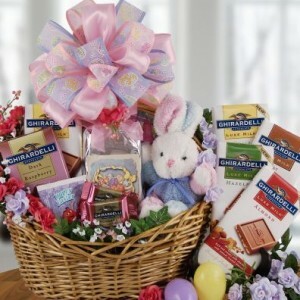 Get your Gourmet Easter Basket just in time for the holiday today at BisketBaskets.com!